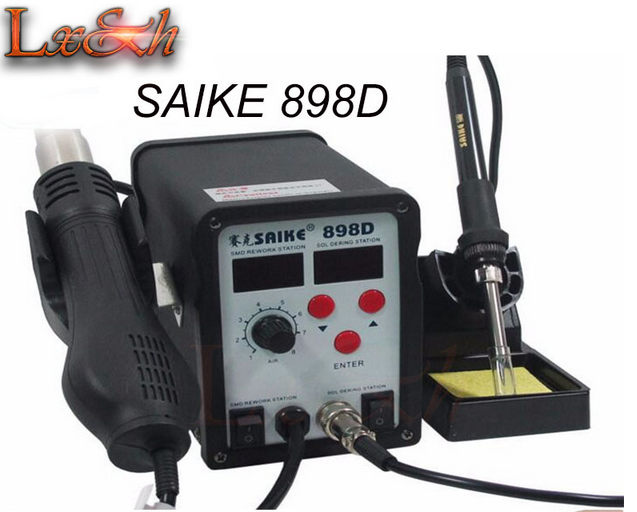 SAIKE 898D is 2 in 1 Hot Air Gun Soldering SMD Rework Station. SAIKE 898D 2in1 Hot Air Gun have hand handle. SAIKE 898D 2 IN 1 hot air rework station have Auto cold wind function. The Saike 898D is a highly cost-effective Rework Hot Air Station, which is the equivalent of a hot air gun and a soldering iron 937 (anti-static), focusing on use of the imported skeleton-type heating core and brushless fans. It is not only used for Computers and mobile phones but also suitable for various of components' solding, such as: SOIC, CHIP, QFP, PLCC, BGA, etc. 1. SAIKE 898D can control temperature,rapid rise of temperature, accurate and stable temperature. 2. SAIKE 898D have Adjustable airflow, large and soft airflow, easy adjustment of temperature, suitable for multiple usages. 3. SAIKE 898D have Hand handle with sensor switch, system will turn into the working mode while the handle is held; and the system will standby while the handle is put on the holder, which is very convenient for operation. 4. SAIKE 898D support Automatic cooling of the system will prolong the life of heating element, and protect the hot air gun. 5. SAIKE 898D have Long lifetime, low noise Brushless fan. High quality heating element with good quality heating wire and double efficiency at the same power will prolong its life and save energy. Handle with sensor switch, as long as gripping handle, the system can quickly access operating mode; Handle released, the system will enter in the standby mode, real-time operating for convenience.